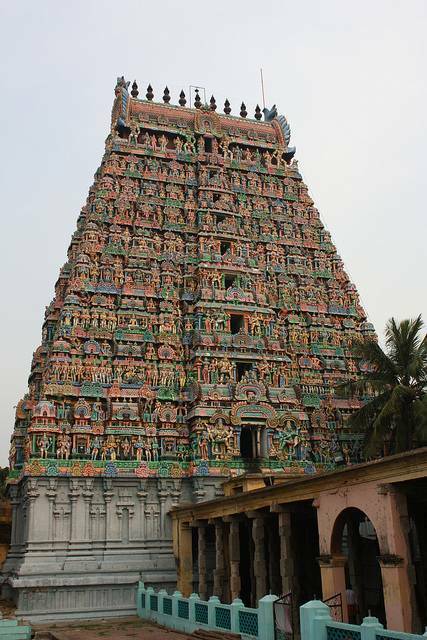 Located amidst of Kumbakonam Town, Adi Kumbeswarar Temple is major attraction of the town. Aging 1300 years, the temple is strongly connected with Mahamaham Festival which is conducted once in every 12 years. The temple is one of the Paadal Petra Sthalam which was praised by Shaiva Saints in 7th century. As per legend, Lord Brahma hold a pot (Kumbham) full of nectar (Amirtham) containing the seeds of life and he h to recreate the universe after the Prilayam (Dissolution). Lord Shiva broke the pot by shooting an arrow on it. The pot broke and the Amirtham fell into the Mahamaham Tank. Lord Shiva then made a Shiv Lingam out of Amirtham and Pot mud and placed it nearby the Mahamaham Tank. Thus the shiv ling inside the temple is called as Adi Kumbeswarar. Its 9 storeyed RajaGopuram which is 125 feet in height. Sprawling across 4 acres of land amidst of Kumbakonam town, Adi Kumbeswarar temple is the largest Shiva temple of Kumbakonam. There is also a shrine for his consort “Mantrapeeteswari Mangalambika” parallel to “Kumbeswarar Swamy” Shrine.